On reaching its 80 anniversary Gerflor’s Mipolam continues its global success story with increased innovation, design and new ranges. Sold in more than 60 Countries the Mipolam story has just reached a new chapter in its long life. Some may think that being eighty years old isn’t that cool. They’d be very wrong. Since 1937, the year that international flooring specialist Gerflor launched their homogeneous flooring Mipolam, we’ve seen man landing on the moon and the world-wide web being invented. For Gerflor during this 80-year period it’s been about providing products that have always been fit for purpose. The Mipolam range has a legacy of testing going over many decades providing a stunning array of products and delivers the broadest, most comprehensive collection of homogeneous flooring available in the marketplace. Since 1937, Mipolam has grown from a single product line to 25 different lines with more than 300 colours available worldwide. The original star in the homogeneous stable is Gerflor’s Mipolam Symbioz™ flooring which was the first Mipolam 100% bio-based plasticizer made of corn and wheat. Gerflor’s R&D heritage and technical capability with Mipolam Symbioz™ also delivers a high performing product that has a T Group, best abrasion resistance rating and with the exclusive and patented Evercare® surface treatment provides easy maintenance, no wax needed for life and has high stain resistance. Mipolam Symbioz™ also comes with a stunning palette of 26 natural colours enabling freedom of design. Brand new for 2017 is Mipolam Affinity and Mipolam Classic. Mipolam Affinity which has 28 brand new references offers a fully new tone on tone non-directional design with higher contrast levels. The brand-new palette offers exclusive colours delivering natural tones in beige/ brown and greys which are all neatly balanced with accented colours. Mipolam Classic has 18 references with 8 brand-new added. It has a directional design and offers a brand new back embossing feature. Available in rolls and tiles. In extending some of the other products on offer an increased colour palette has now been added. Mipolam Accord with 28 references now has a further 12 brand new colours now available. It retains the same design which is semi directional. The stunning new palette with 28 exclusive colours offers natural tones in beige/ brown and greys and are again, all very neatly balanced with accented colours. Mipolam Cosmo has 24 references with 6 being brand new. It retains the same design which is semi directional. A new palette with 24 exclusive colours offers natural tones in beige/ brown and greys and beautifully balanced with 6 new accented colours. The product is supplied with the exclusive revolutionary Evercare™ treatment which provides increased chemical resistance, easy maintenance and long-lasting durability. Mipolam Esprit has a T Group rating for best abrasion resistance. Exclusive and patented Evercare™ surface treatment delivering easy maintenance, with no wax for life and high stain resistance. A palette of 24 non-directional colours ensures freedom of design. Mipolam Elegance is a high performing homogeneous flooring suitable for heavy duty traffic, available in sheets. Exclusive and patented Evercare® surface treatment delivering easy maintenance, with no wax for life and high stain resistance and comes with a stunning palette of 33 colours with a 3D effect integrated into the design. The Mipolam Troplan range has a directional designs and densely compacted surfaces offering improved wear and ease of maintenance. It has an M Group rating for good abrasion resistance and comes with a palette of 18 semi-directional colours. Creating products that fulfil Gerflor’s commitment to the environment and sustainability of our world is at the very heart of their ethos and thinking. By combining the Mipolam collections with its patented revolutionary Evercare® surface treatment, Gerflor has delivered product lines that offers unparalleled stain resistance to blood and chemicals (including iodine), the best slip resistance in its field, astonishingly low maintenance and unique environmental credentials. Gerflor’s Evercare® surface treatment ensures no wax for life and bacteriostatic and fungistatic properties that deliver increased levels of hygiene. It is also 100% recyclable. Mipolam ranges can be specified in public areas, schools, offices, computer suites, indoor leisure centres, factory floors and storage areas, together with hospital wards, corridors and cleanrooms requiring an aseptic environment. Mipolam provides a versatile solution for both refurbishments and new build projects, supplying clients and customers with a wide choice of products aimed at always exceeding their expectations on quality and design. The UNESCO World Heritage city of Bamberg which nestles in Bavaria, Germany is currently experiencing a boom. When one of the city’s most prestigious medical clinics, the Klinikum am Bruderwald needed new flooring, they would turn to Gerflor to supply the high quality and performance required. The installation would also need to be first class, with the Kups-based flooring company Meusel Fußbodentechnik tasked with delivering and laying the specified Gerflor products. Tobias Knop, Key Account Manager Healthcare, Gerflor commented, “We initially had a very good meeting with Muesel in Kups, who have been a fantastic customer of ours for many years. We also had a very positive meeting with the technical leader from the hospital itself. The benefits associated with our Evercare® easily convinced them to specify 1600m2 of our Mipolam Accord and Accord EL7.” He went on to add, “the Technical Leader at the Hospital Mr Schilling was very satisfied with the final result, together with the easy maintenance aspects of our products”. The visual impact of the Mipolam flooring would be a key feature in the finished look of the project. 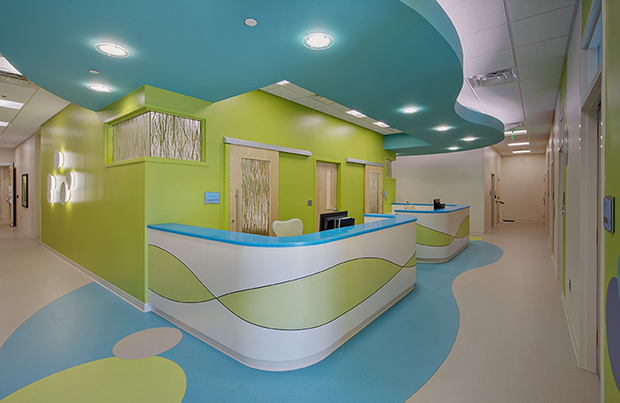 When the WellStar Health System planned its new WellStar Pediatric Centre in Kennesaw, Georgia, USA, they wanted to create a playful, welcoming environment. Their demanding selection criteria for flooring products would be perfectly suited to Gerflor’s Mipolam Symbioz™. The interior features Gerflor’s Mipolam Symbioz™ in corridors, examination rooms, medical scanning areas and laboratories. As the industry’s only bio-based, homogeneous sheet flooring, Mipolam Symbioz™ utilises a unique 100% plant-based phthalate-free plasticizer and contains over 75% sustainable or renewable raw materials. Limiting the spread of infections is vital for a pediatric healthcare facility. Symbioz™ as with all Mipolam healthcare flooring is ISO 22196 certified to limit the spread of infections (including MRSA, E. coli and S. aureus) at 99% Durability and ease of maintenance were also important considerations. Symbioz™ has the best wear resistance for high-traffic areas and a no-wax-for-life surface treatment, which provides for a healthy lifecycle. Some 7400Km away in France, Gerflor’s Mipolam range would also be making another huge contribution to a facility. At the European Aseptic and Sterile Environment training centre (EASE), which is on the Strasbourg University Illkirch Campus in the Alsace region students are immersed in real-life industrial conditions, becoming directly operational as soon as their tuition ends. The facility provides a high-quality training environment with 43002>/sup> dedicated to the training of production protocols in cleanrooms. As a forerunner in the design of ultra-contamination control flooring products, Gerflor were delighted to be a sponsor of the EASE project by supplying their new generation Mipolam Symbioz™. It’s a range that’s designed and certified for supplying high levels of chemical resistance, whether its particulate, molecular or microbiological. It has no heavy metals, no solvents, no formaldehyde and is 100% REACH compliant. Sponsorship of the EASE project is a testament to Gerflor’s commitment to investing in the future…whilst keeping an eye on the present. As a worldwide recognised brand that’s a status symbol of quality and durability the spectacular new Mipolam references from Gerflor is yet another indication that this forward-thinking flooring manufacturer fully understands the needs of their customers… and the world at large. Gerflor Group creates, manufactures, and markets innovative, decorative and sustainable solutions for floors, walls and finishes. Gerflor develops specific solutions to meet every indoor market application need; housing, healthcare, education, sport, retail, industry, offices, hospitality and transport vehicles. Gerflor Group gathers several world-renowned product brand names, such as Taraflex®, Mipolam®, Tarabus®, Connor Sports®, Sportcourt® and Gradus®. The Group turnover is 830M€, employs 3,500 people, operates 16 production sites and has customers in more than 100 countries.